Got a small space? This Glass Front Cash Register Stand gives you two features in one fixture! Doors in the back and a glass shelf on this stand give you easy access to items on display. A recessed top keeps your register securely in place. 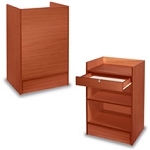 This register stand comes in four colors to give you several different options. 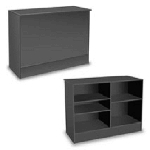 As your store expands, you can add this service counter or other coordinating modular pieces. 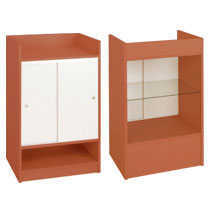 Order your checkout stand today!